A charity event organised by the Barnt Green Chuggers running group has raised £20,000 for the Geoff Thomas Foundation and the Barnt Green Scout Hut Appeal. The “Big Apple Bash”, held at Barnt Green Cricket Club, took its theme from the Chuggers’ imminent trip to New York to run the marathon there on November 4. 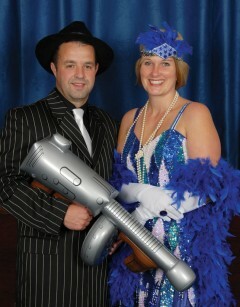 The 300 guests arrived dressed as 1920s-style “Gangsters and Gals” and were entertained by 12-piece band Demons of Tune. Chugger Andrew Pearson, running the marathon for the second time, has encouraged 11 others, including fellow Chuggers Rob Marshall, Steve Read and Ian Rowledge, to join him. Geoff Thomas, whose Foundation supports leukaemia research and care, said he was thrilled at the generosity of the donations, and wished the Chuggers well in the marathon.